1. What is the difference between renting or leasing artwork? Renting artwork is a great way to bring a different feel to your home or office. Renting is for a specific event for a specified time. For instance a wedding would need artwork for 2 - 3 days. Leasing artwork is for a longer time such as one month to two years, depending on the lease contract. At the end of the lease time, the artwork can be returned or there is a buyout and the artwork now belongs to the person or business who rented it originally. 2. What is the advantage of leasing over renting? Obviously for one thing with leasing you get to have and enjoy the artwork for a longer time. Also with leasing, you can take advantage of swapping out the currently leased artwork for different artwork once for a one year lease and twice for a two year lease. If you lease the artwork for your business, you can deduct that as an expense just like the photocopier or computer you currently lease (check with your accountant for applicable tax rules). 1. What are some of the events that artwork could be rented for? ●As a backdrop in a video, commercial or as a prop in a movie or TV series. 2. What would be the appropriate type of artwork to rent for an occasion? As the event anniversary gets past the 5th year, the elements to symbolize the anniversary get more solid and firm - less ephemeral. 3. How does renting work? When renting, there are two components - the actual rental charge of the artwork & the delivery/pickup charge. The rental charge varies with the retail price of the artwork. It is a nominal charge starting in at $25/day. The delivery charge is free within 10 miles of WSG Gallery. After 10 miles the pickup and delivery charge starts at $25 depending on how far away the artwork has to be delivered. When renting multiple (2-6) pieces one delivery charge applies. So if 5 artworks are rented, there is only one $25 charge. 1. How does leasing work? Leasing works much the same as renting (see item # 3 above), just more paperwork. Give Carl a call at 304-263-2391 or email him at carl@wsggallery.com for more details. 2. What can leasing artwork do for my business? a. Leasing an artwork can be seen as having a silent salesperson in your office/lobby/waiting room. It demonstrates, on a subconscious level to your client, the sophistication of your business and management. It can also pre-sell your prospect on your services and turn them from a prospect to a client quicker. Soushi 1 or Soushi 2 would be perfect for a fertility or gynecologists office. It communicates silently what the desired results are going to be for a consultation. Another example would be the sculpture Aria in an opera companies office, Motion or Momentum in a transportation office (train, limousine, airline) or Eihei in an executive security office. The leased artwork(s) can also be a conversation starter, to open up reticent clients. b. Flexibility to meet your business needs whether it is trying out a style that you want, or to live with the art before deciding to purchase it. c. Allows your business to have high quality art without a large capital outlay, just a low monthly lease payment. 3. What types of businesses can benefit from artwork in their environment? Just about any business can benefit from artwork, particularly ones that need to project an positive or sophisticated corporate image. Law firms, financial institutions, corporate offices, banks, insurance companies, hotels, and any business that needs to stand out from their competition. 4. Do you need a pedestal to put the leased sculpture on? 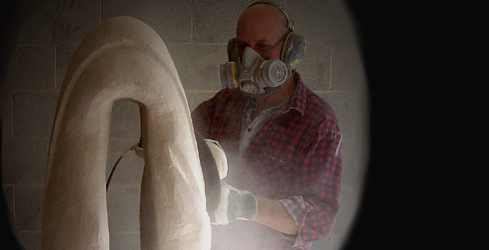 We also make custom sculpture pedestals that are complementary in design to the sculpture that you either own or lease. Contact Carl at 304-263-2391 or carl@wsggallery.com & ask about pedestal availability.